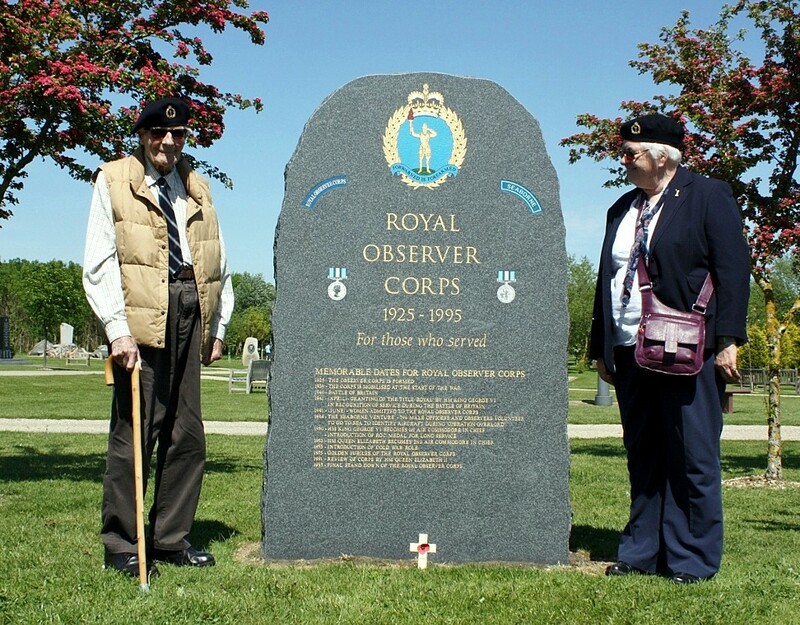 Alrewas 2014 - Royal Observer Corps Association This website was set up in October 2012 and is the new official site for the Royal Observer Corps Association. This year spring arrived early, thus the Hawthorne Trees were seen in full flower for the first time by many of the sixty three members assembled in the ROC Grove, on a beautiful sunny day. 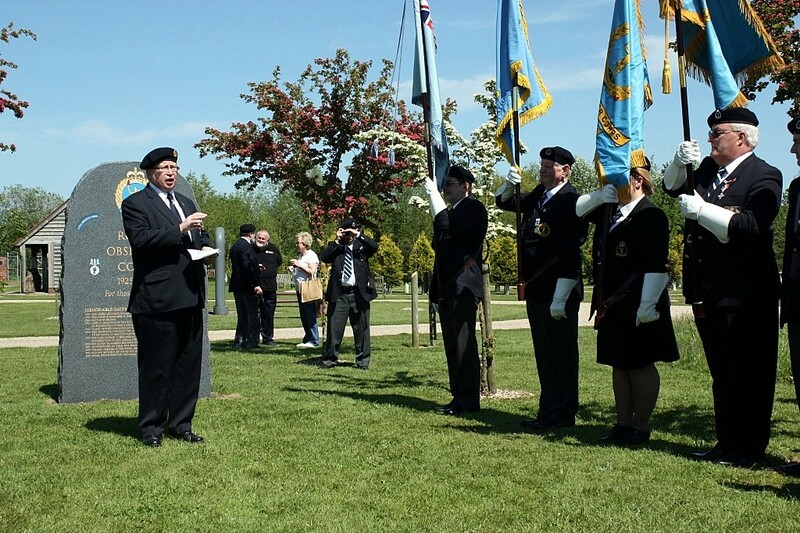 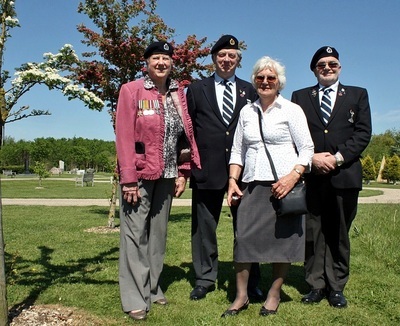 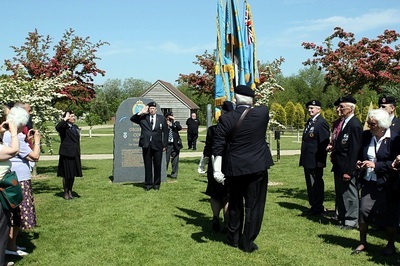 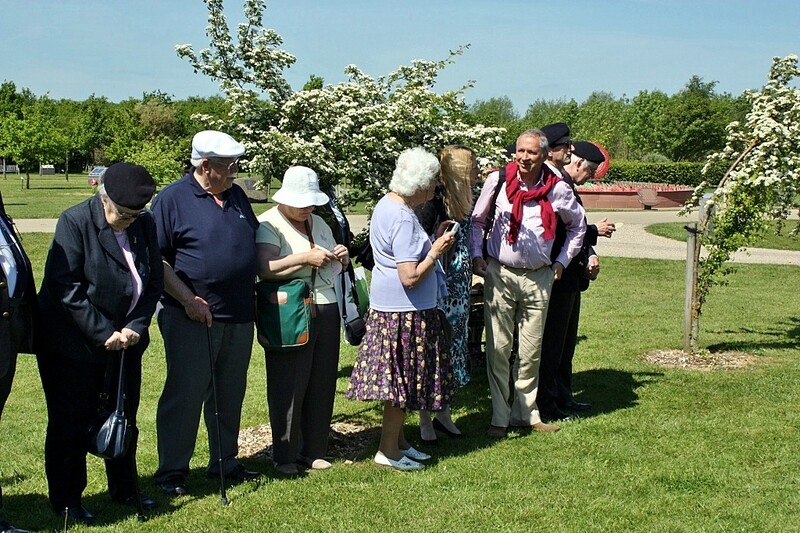 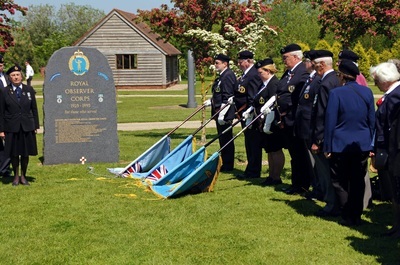 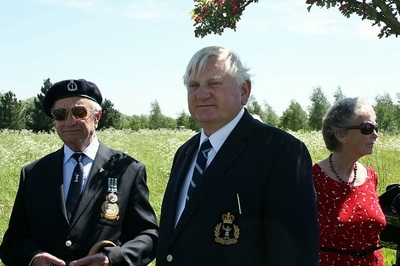 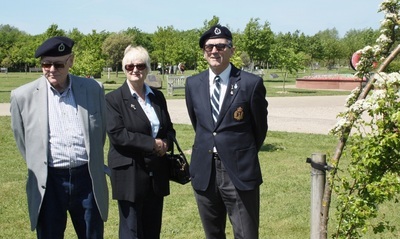 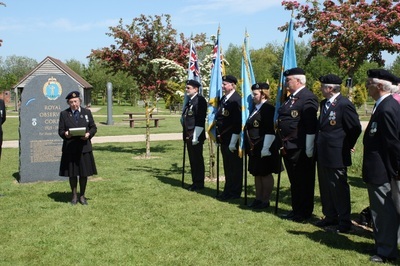 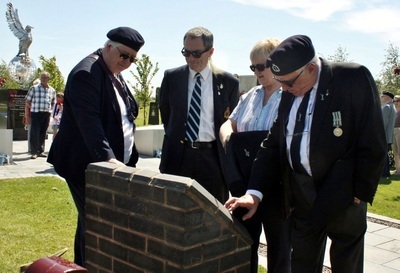 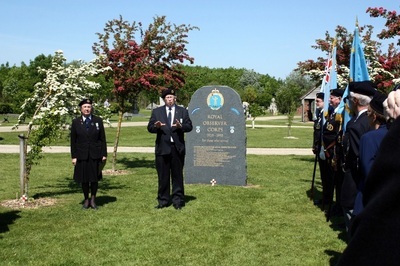 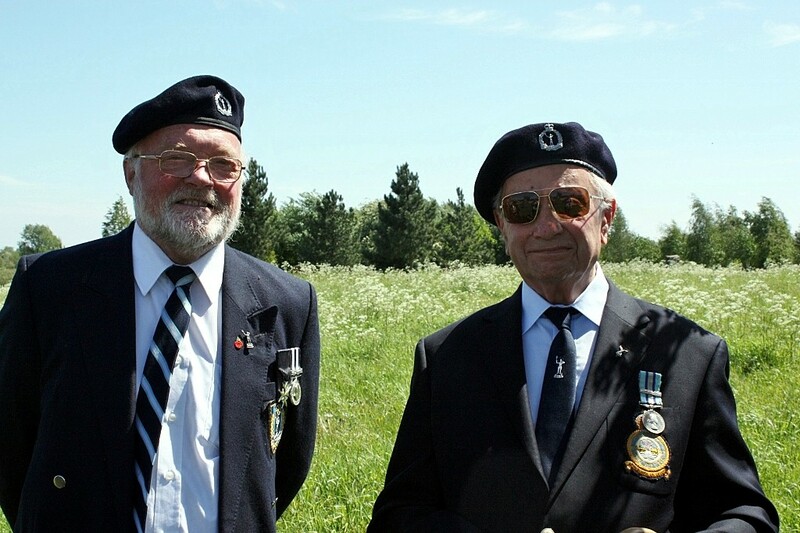 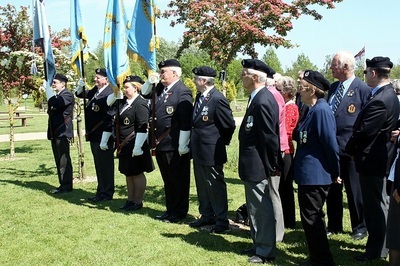 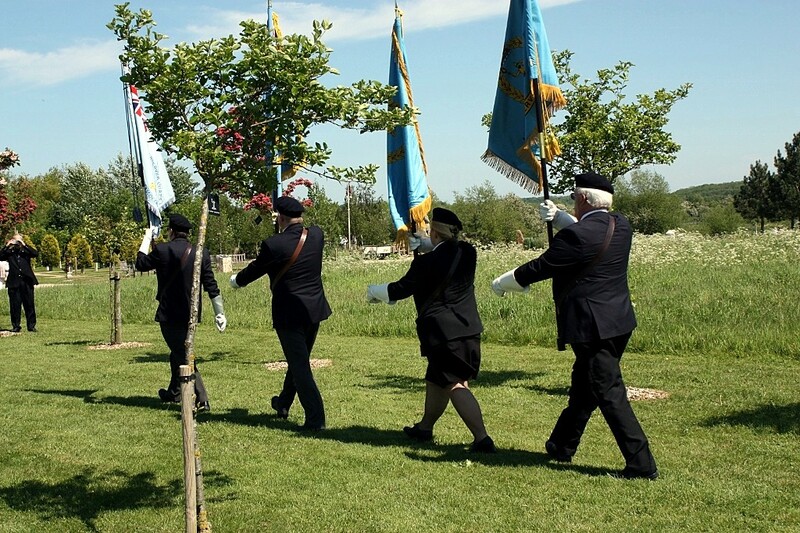 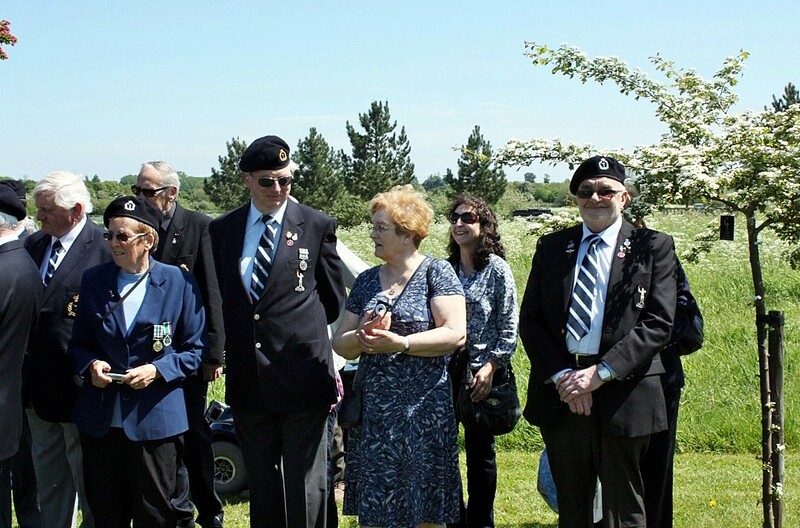 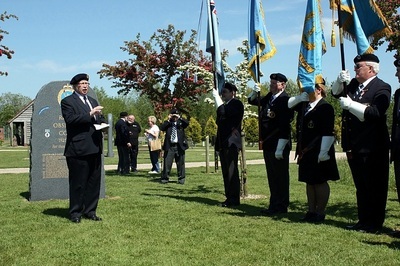 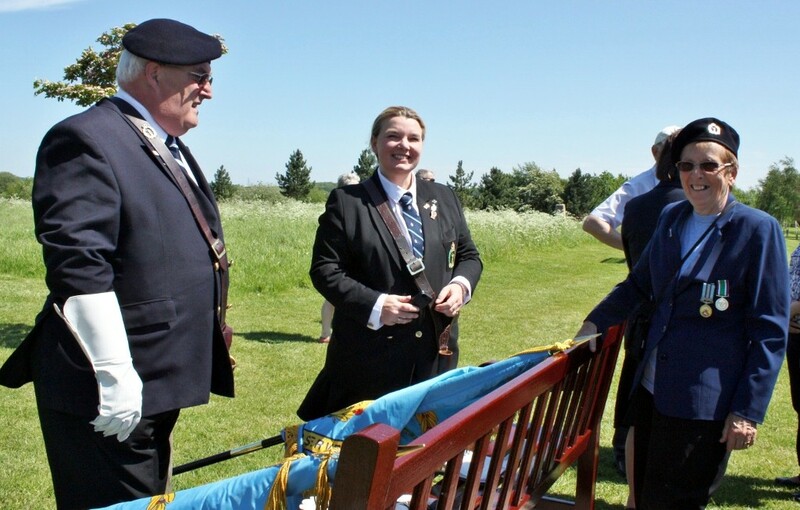 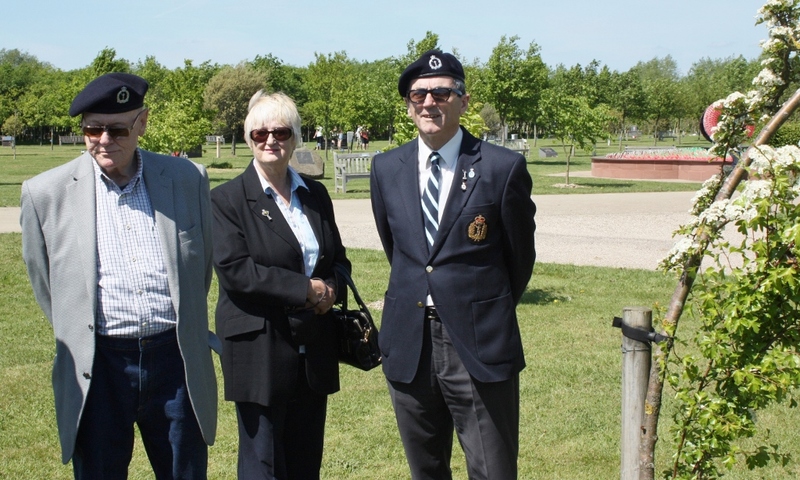 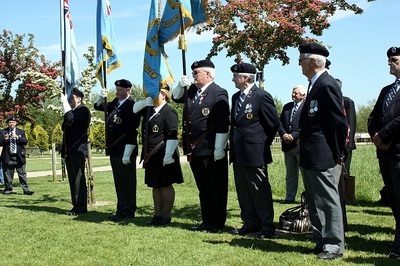 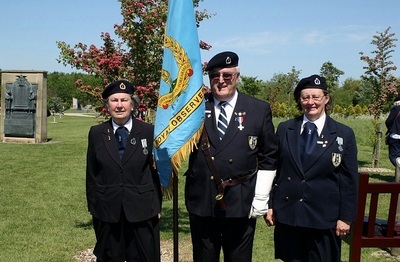 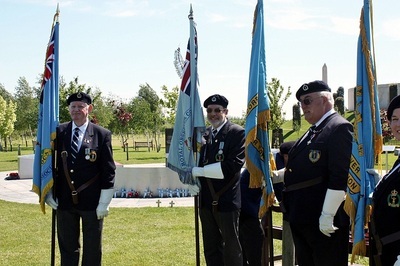 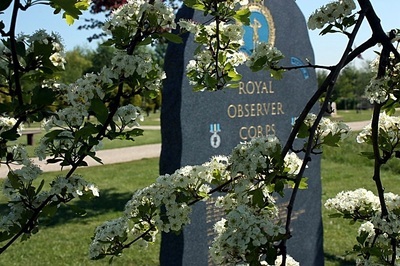 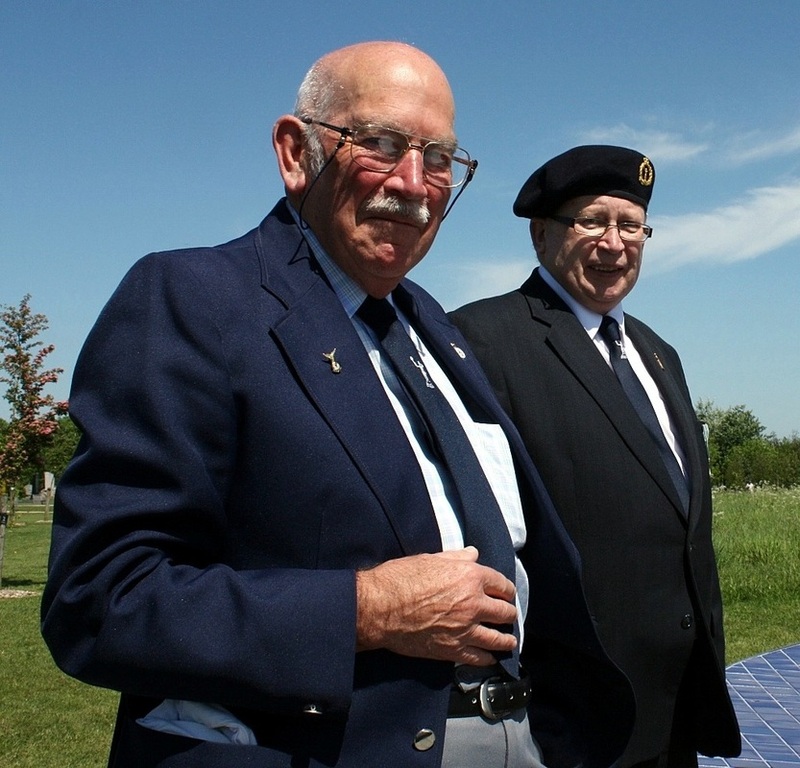 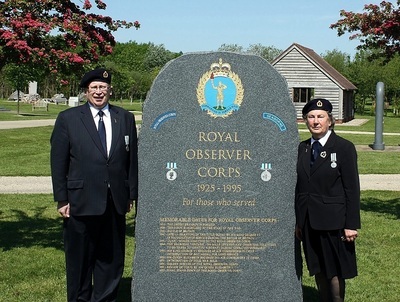 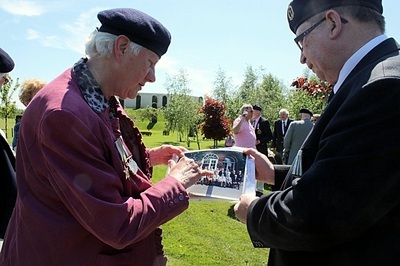 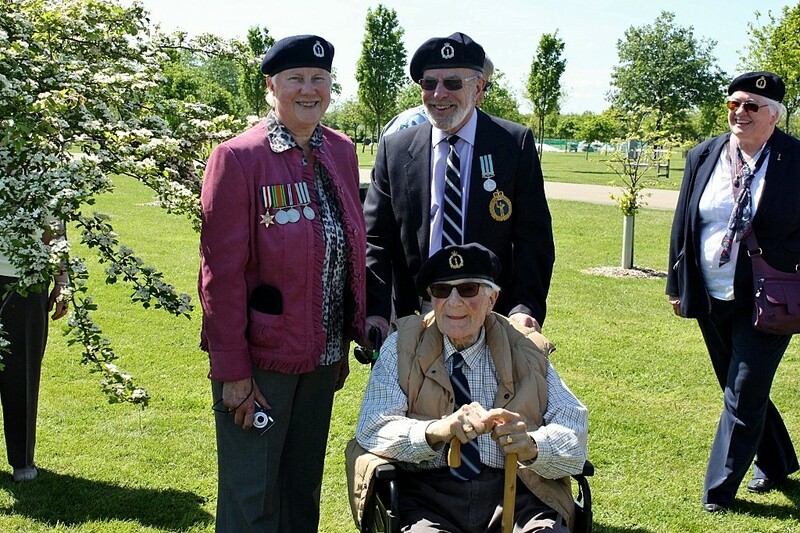 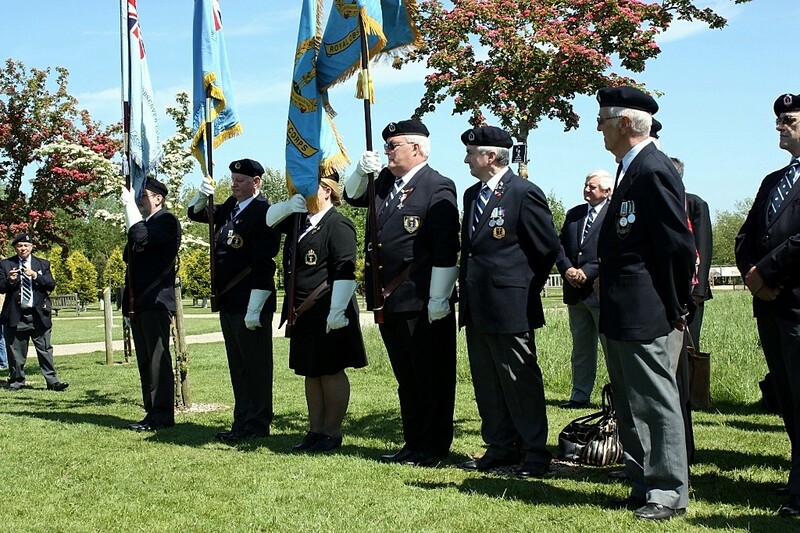 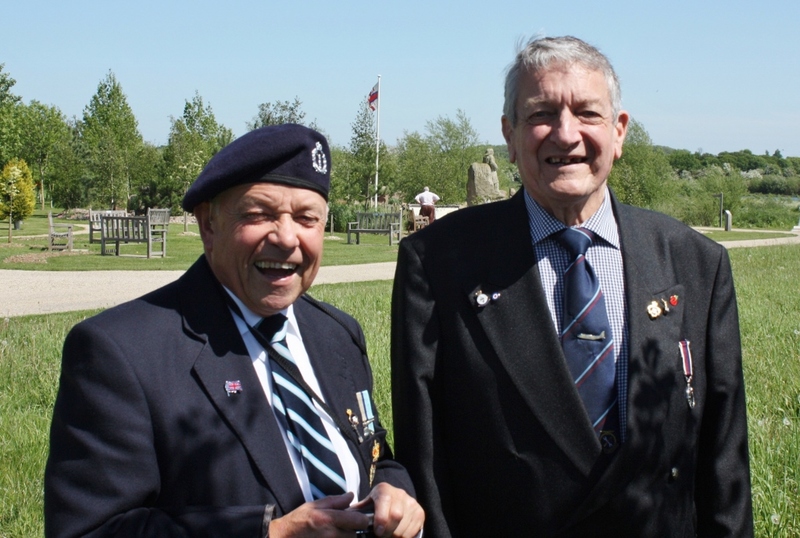 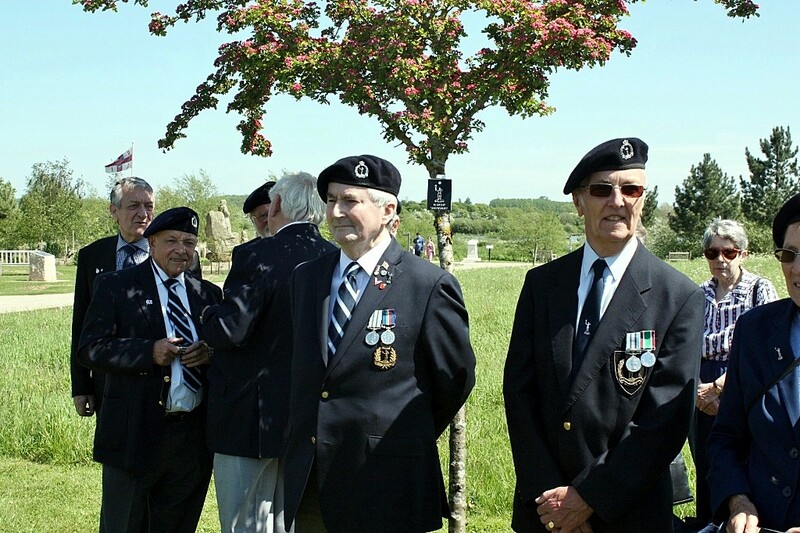 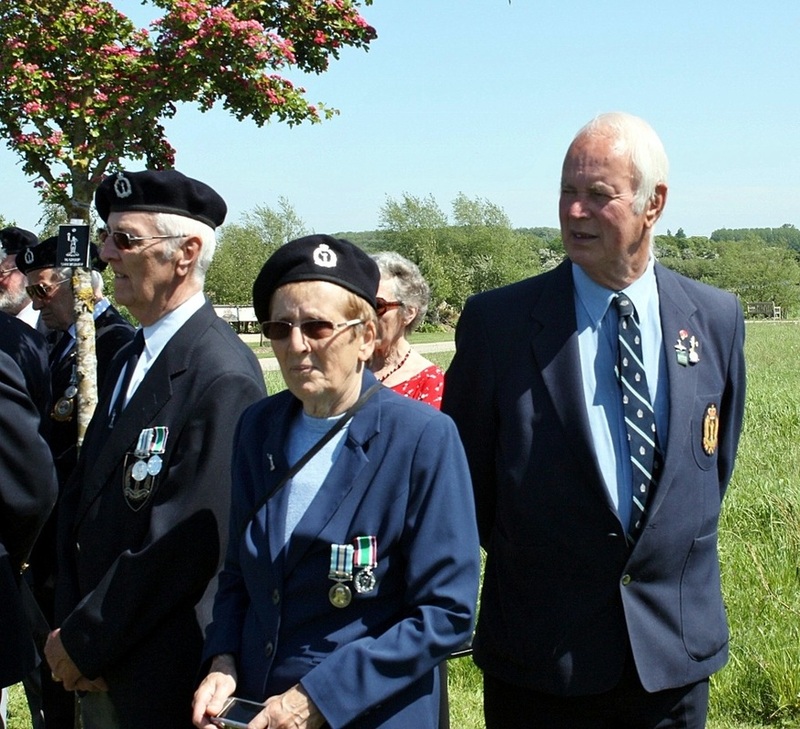 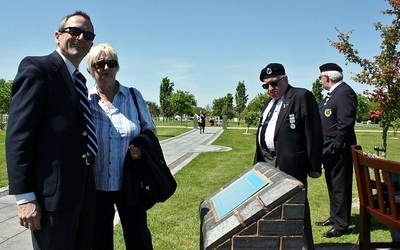 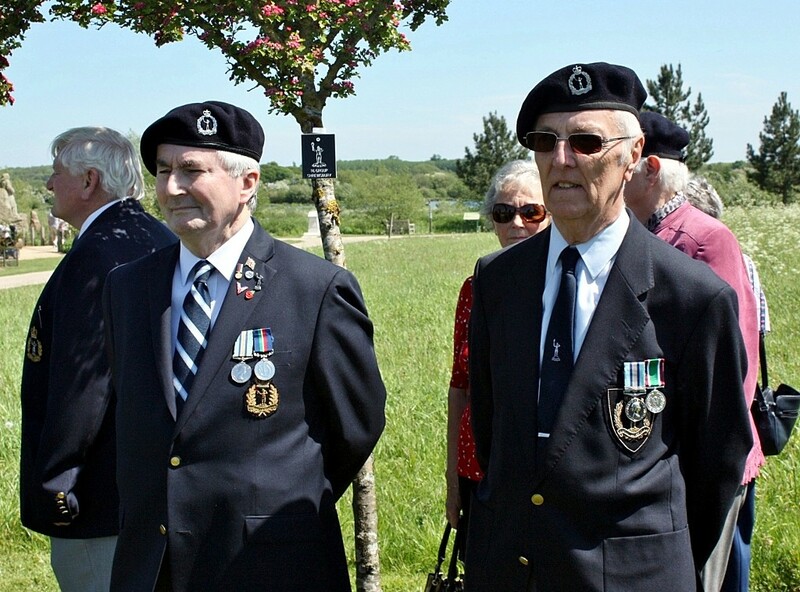 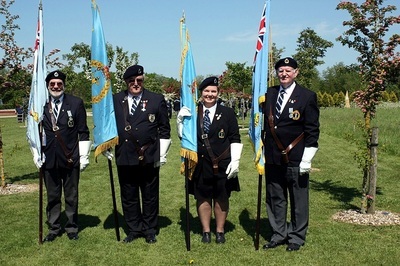 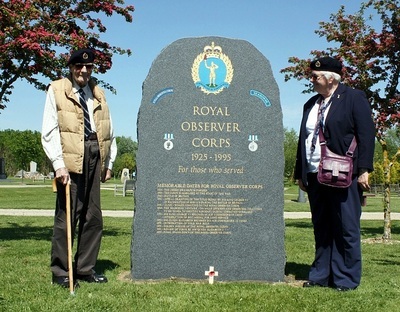 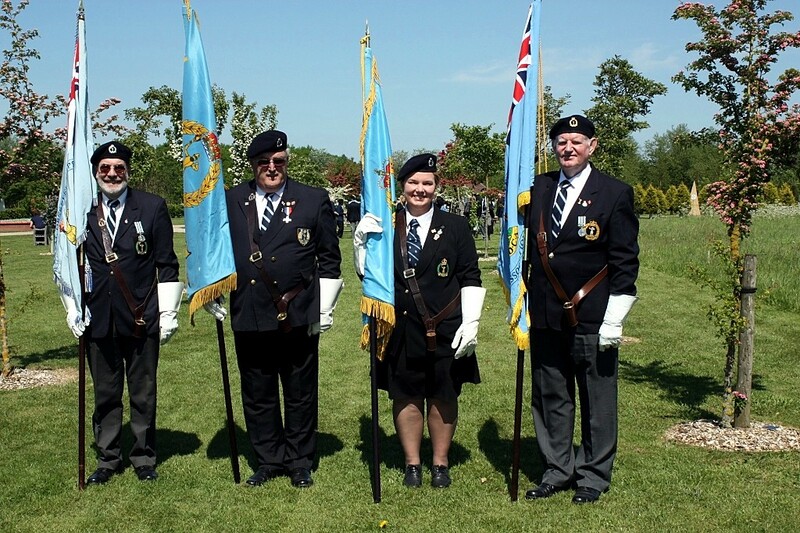 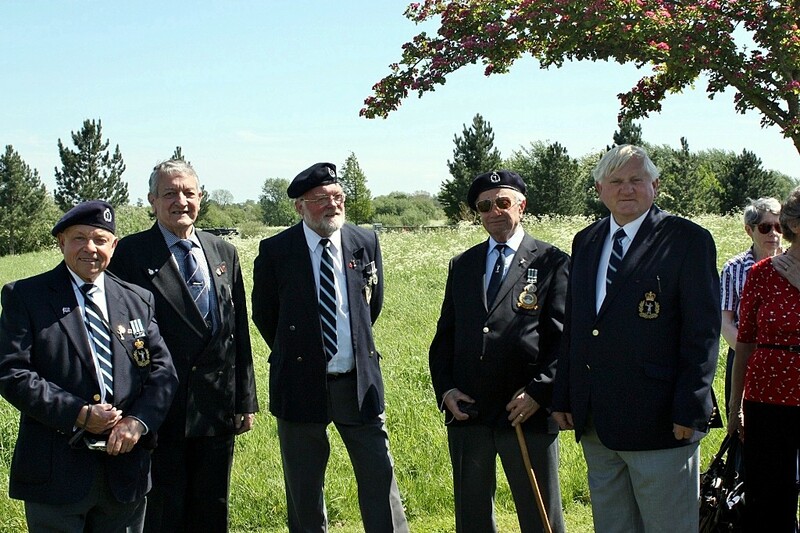 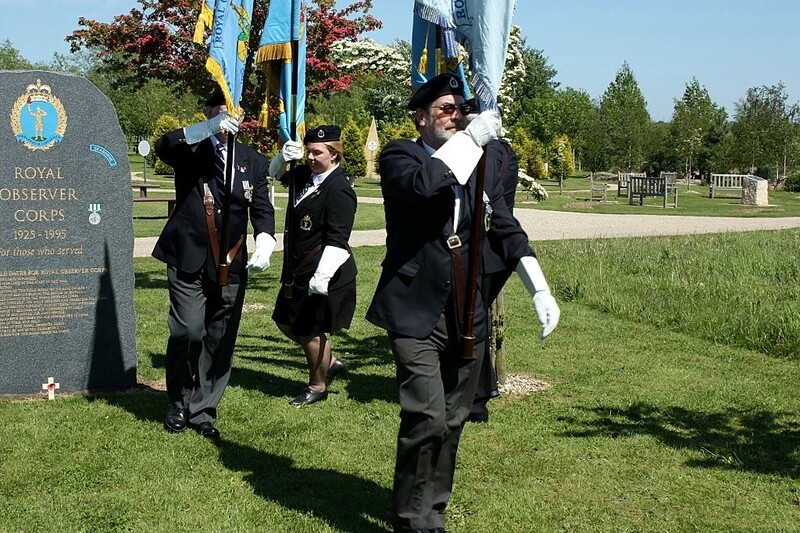 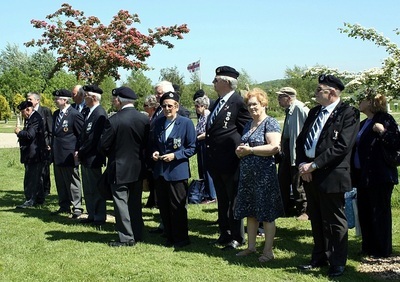 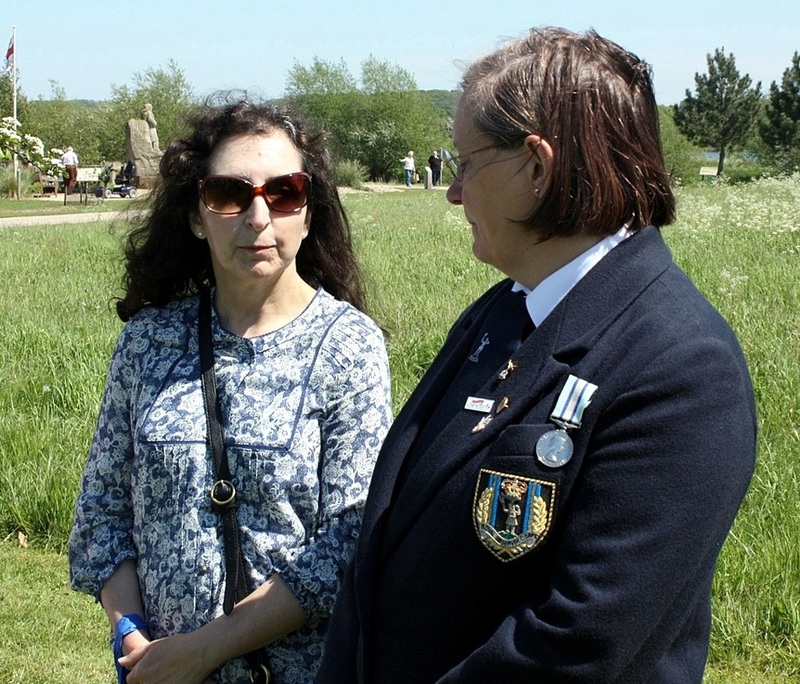 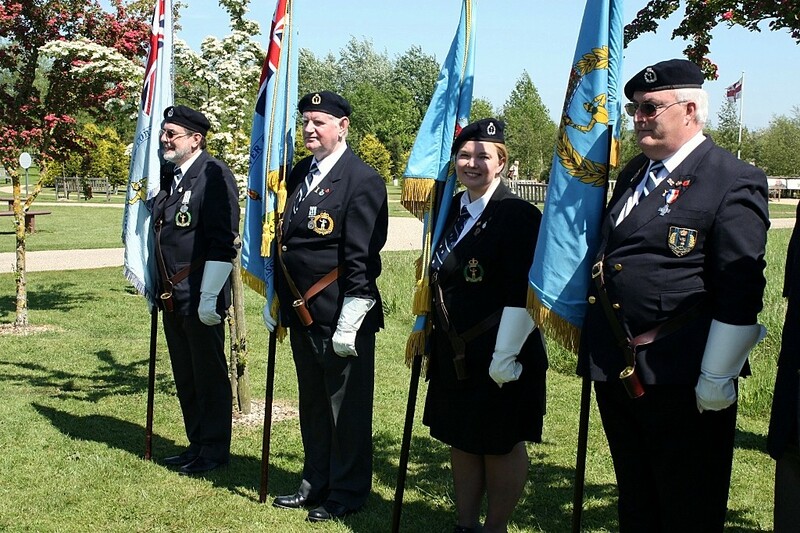 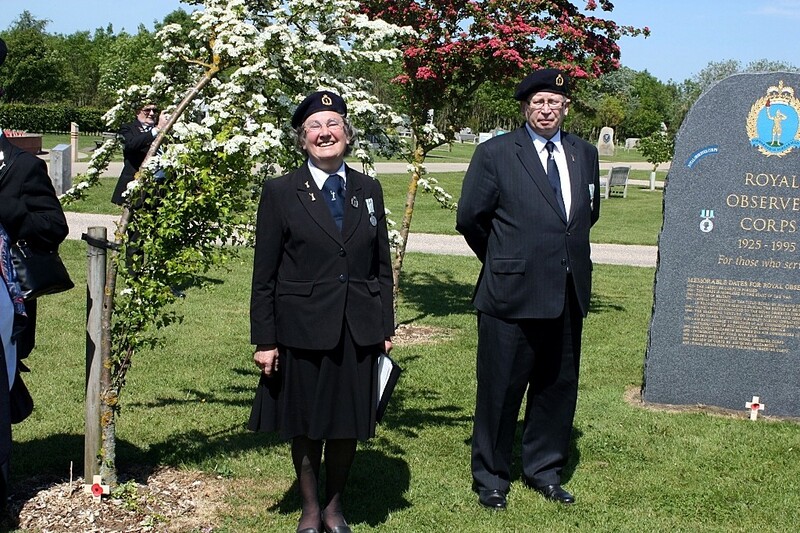 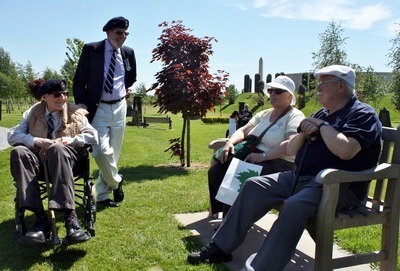 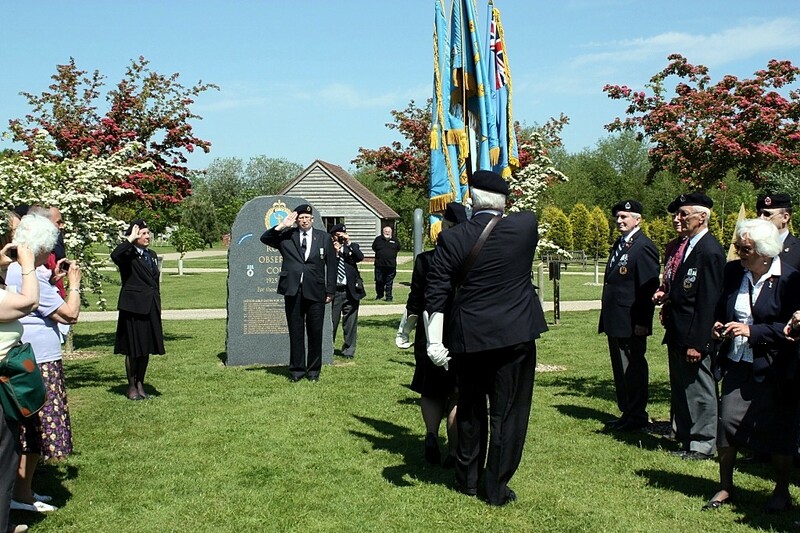 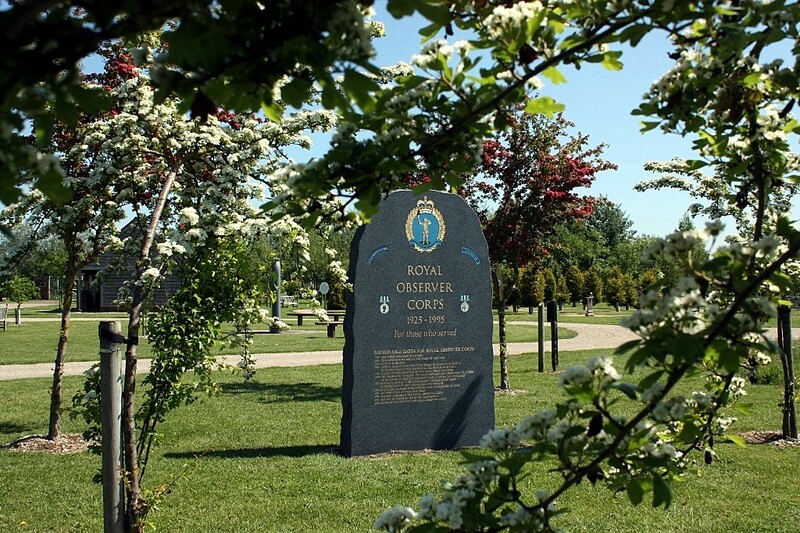 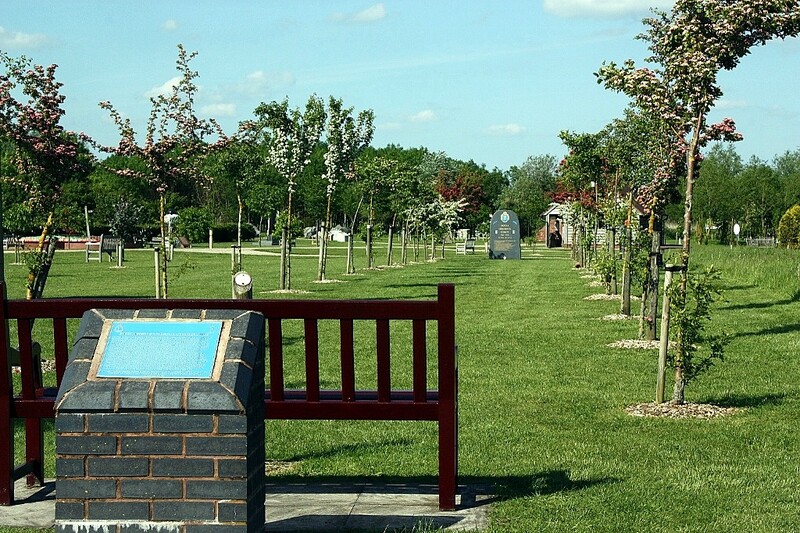 The occasion was the Association’s annual gathering, at the National Memorial Arboretum, to remember all those who served 70 years on from the D-Day Landings, and to hold a very special tribute to commemorate those who served as Seaborne Observers aboard Armed Merchant Ships back in 1944. 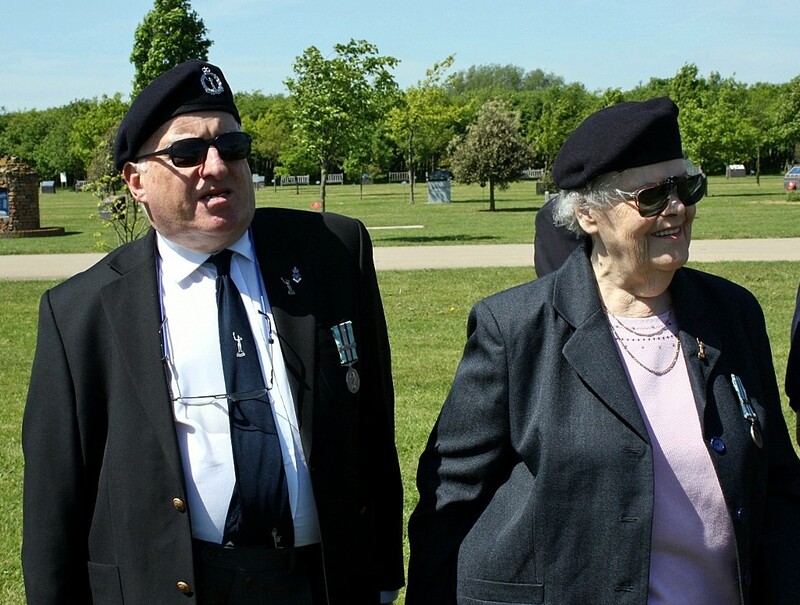 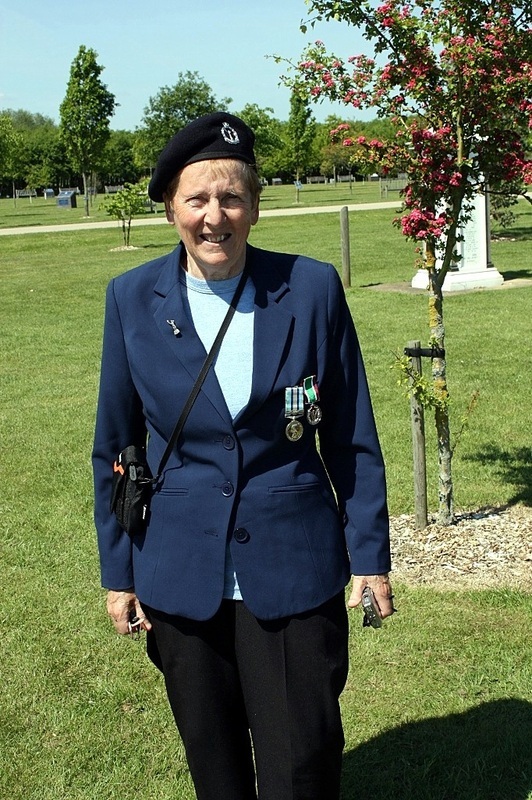 Due to advancing years no surviving Seaborne Observers were able to make the journey, but Derek James had asked June Jay to represent the Seaborne Wing on the day. 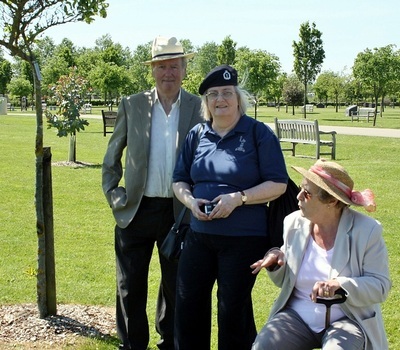 Assembled around the Tree, dedicated to the Seaborne Wing, was the National Standard carried by Gordon Johnson of 8 Group Coventry, accompanied by Standards from 2 Group Horsham, carried by Ian Burrows, 3 Group Oxford carried by Rosemary Ward and 12 Group Bristol carried by Chris Shire all marched down the Grove to the Memorial Stone. 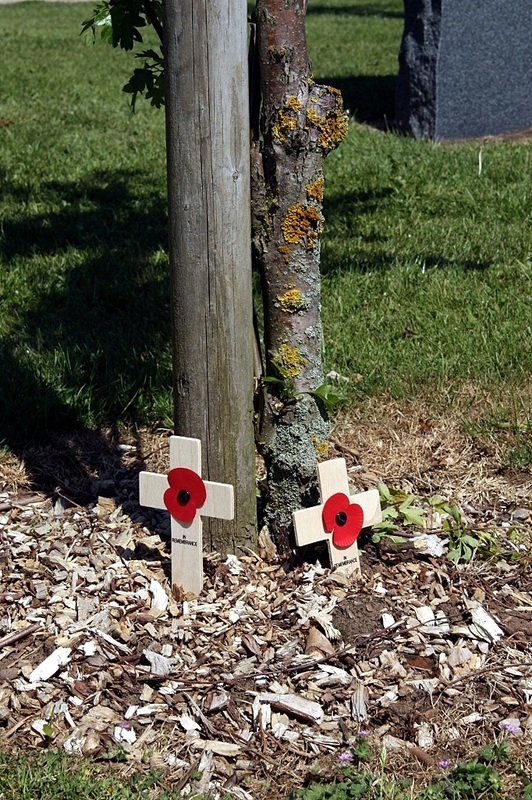 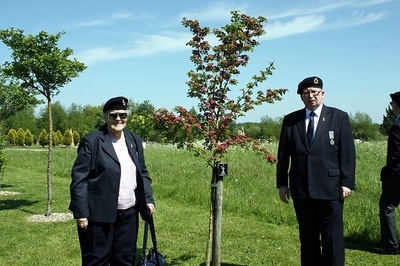 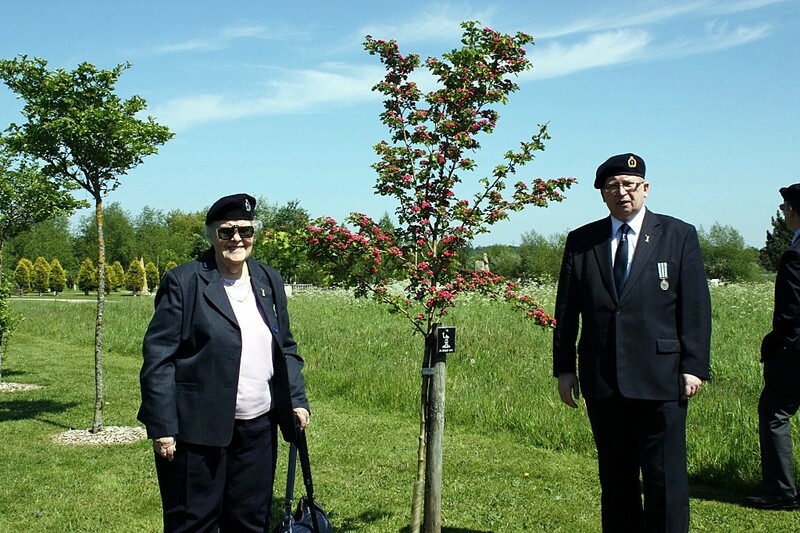 Les Mitton and Jenny Major from Coventry Group each laid a cross at the foot of the Seaborne Tree in remembrance of the two Seaborne Observers killed in action: Chief Observer John Bancroft and Observer Bill Salter. ROCA National Chairman John Sharpe laid a Remembrance Cross at the ROC Memorial Stone to remember all who served. 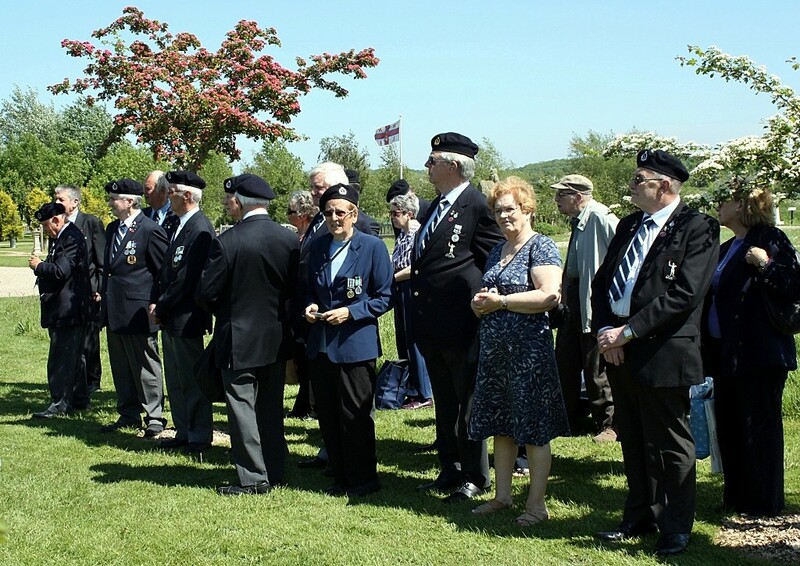 A few moments of silence was observed after the Exhortation given by National Secretary Jenny Morris, followed by the Kohima. The short Service ended with the ROC Prayer. 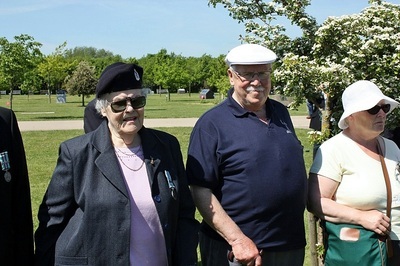 (Photos by Jenny Morris with thanks to Bryan Butler 12 Group who took the photos during the service, plus one or two from Terry Austin of 3 Group Oxford). 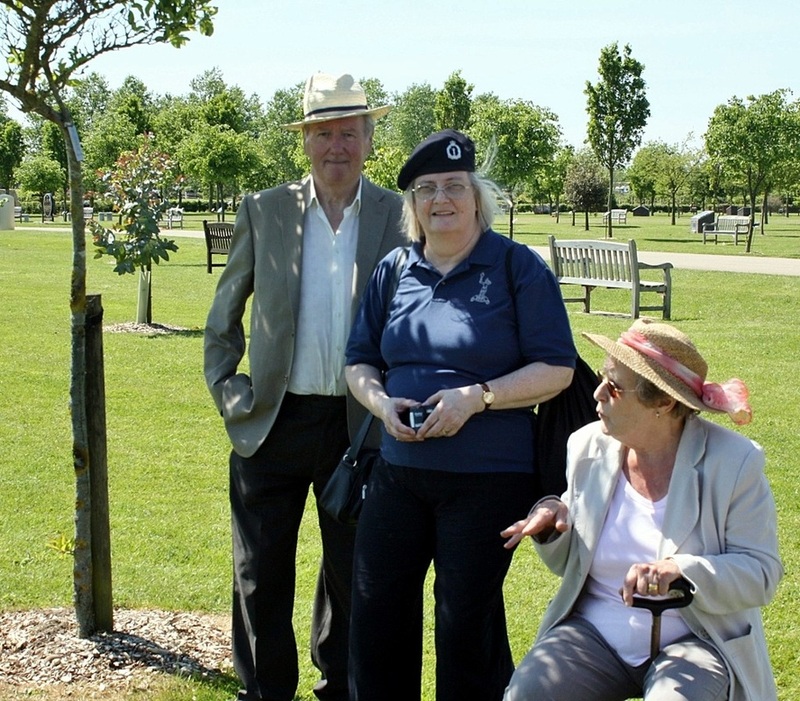 To view the pictures click on an image to enlarge it and then scroll left or right.